Saves time and costly excavation of below grade walls. High durability and impact resistance. Waterstop™ CP will waterproof from the interior wall even under instances of hydrostatic pressure, as well as waterproof from the exterior side of the wall. For above or below grade surfaces, vertical or horizontal. Interior or exterior use. Waterstop CP acts as a moisture barrier for wall coatings to ensure a good coating bond. Long lasting, will not shrink or peel. Apply Waterstop™ CP in one coat by trowel, or multi-brush application to block, brick, concrete or stone. 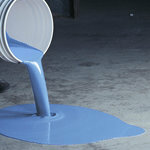 Pre-measured components of Waterstop™ CP are packaged in a 5 gallon pail for easy application. Pre-measured 5 gal kit for easy application; Components Include: 50 lbs powder. Waterstop™ CP is approved for shipping to all 50 states by ground or air.